Sen. Joseph McCarthy listens to his attorney, Roy Cohn, during the televised Army-McCarthy hearings in 1954. The series of hearings badly damaged the senator's image and led to a vote of censure by the Senate. The latest barrage of presidential tweets attacking independent counsel Robert Mueller has made mention of two historical figures who were household names in America a generation or two ago — names that can still raise eyebrows — and blood pressure. One is John Dean, a key figure in the exposure of President Richard Nixon's role in the Watergate scandal in the early 1970s. That scandal led to Nixon's resignation, on the brink of impeachment, in 1974. Dean was the White House counsel in 1972, when burglars were caught bugging the headquarters of the Democratic National Committee in the Watergate Hotel. The burglars were working for Nixon's re-election committee, and a cover-up of that connection was engineered within the White House. He told the committee that he had warned Nixon that "there was a cancer growing on the presidency and if the cancer was not removed, then the president himself would be killed by it." That was on Trump's mind this past weekend because the current White House counsel, Don McGahn, has reportedly spent 30 hours talking to Mueller's team, which is investigating obstruction of justice and possible collusion between the Trump campaign and Russia. Trump was at pains to say McGahn had not become a witness against the president — as Dean had 45 years ago. "The failing @nytimes wrote a Fake piece today implying that because White House Councel Don McGahn was giving hours of testimony to the Special Councel, he must be a John Dean type 'RAT,' " he tweeted. Dean, still alive and well at 79, was a guest on NPR's All Things Considered on Monday and said he had not been shocked when Trump called him a rat. He said it struck him as a "fairly normal sort of invective from the president," who in another tweet referred to Mueller's investigators as "thugs." Dean added that the president might not know everything that McGahn told the investigators over those 30 hours of interviews. "I think he probably provided timelines," Dean said, for events in the campaign and in the White House. Dean called this "just invaluable testimony." Reporting of McGahn's cooperation with Mueller — and the specific fact that McGahn had sat for 30 hours of interviews with Mueller's team — appeared Saturday in The New York Times. That story said McGahn and his personal attorney had begun to fear that he was being made the "fall guy" if Trump or others in the White House were found to have broken any laws. A similar suspicion has long been seen as part of Dean's motivation in turning against Nixon 45 years ago. Dean on Monday told NPR's Ailsa Chang that McGahn's own personal lawyer was "smart in making [McGahn] a witness and not a target" in Mueller's overall investigation. "That was in McGahn's interest, because he thought he was being set up to be a target." Beyond that, Dean noted, the law requires the White House counsel to represent the office of the president as a government employee — not to represent the president as a personal client: "If McGahn is aware of any wrongdoing on the president's part, he has to really report that up and out under the standard code of professional conduct that now exists." Trump's Sunday morning Twitter storm also included another, stranger historical reference. It urged Americans to "study Joseph McCarthy," suggesting that Mueller's probe was so unfair and out of bounds that it made the notorious 1950s Communist hunter "look like a baby." Anyone familiar with McCarthy's history would have to smile at that image. Although the youngest member of the U.S. Senate when he first took the oath in 1947 at age 38, his receding hairline and perpetual five o'clock shadow made him look much older. McCarthy's first years in office attracted little attention outside his home state of Wisconsin. But in February 1950, he gave a speech in Wheeling, W.Va., alleging that he had a list of actual communists working in the U.S. State Department. The charge created a sensation in the atmosphere of the time, when war was breaking out in Korea and powerful Communist regimes ruled China and the Soviet Union. McCarthy tapped into the fear and confusion of the Cold War era and greatly contributed to both. Supporters even wanted Dwight Eisenhower to put McCarthy on the national ticket in 1952 (Eisenhower instead chose Nixon, then a senator from California). While denied a shot at the vice presidency, McCarthy used his investigative powers as a subcommittee chairman to haul a procession of witnesses before the cameras on Capitol Hill. There they were grilled relentlessly by McCarthy or his principal counsel, Roy Cohn. Their abusive style eventually proved their undoing when they took on the U.S. Army over the promotion of a major they found suspicious. The televised Army-McCarthy hearings in 1954 badly damaged the senator's image and led to a vote of censure by the U.S. Senate. Humiliated, he gradually withdrew from the Senate and entered a hospital in Washington, where he died in 1957 at the age of 48. 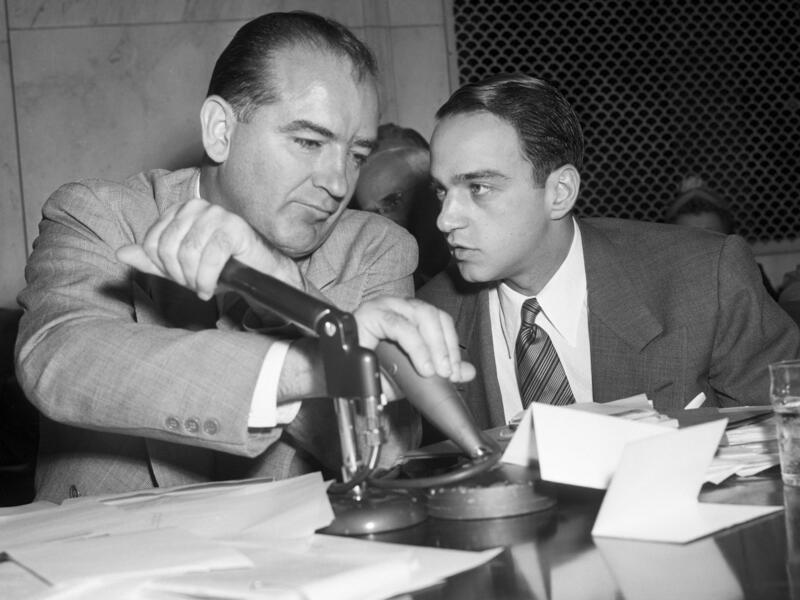 "Senator McCarthy's zeal to uncover subversion and espionage led to disturbing excesses. His browbeating tactics destroyed careers of people who were not involved in the infiltration of our government. ... These hearings are a part of our national past that we can neither afford to forget nor permit to reoccur." Trump was only 10 when McCarthy died. But he has a personal connection to him through Roy Cohn, who returned to New York City and became a legendary paladin for powerful politicians, mob bosses, sports figures and entertainers. Trump and Cohn met at a Manhattan nightclub in 1973, when Trump and his father, Fred, were being sued by the federal government for racial discrimination in their rental units. Cohn advised the Trumps to defy the government and defended them in court. The case eventually settled with no admission of guilt. Trump would later describe Cohn not only as his attorney but also as a mentor. One of Cohn's proteges, Roger Stone, would become a confidant and sometime aide to Trump. Stone had worked for the Nixon re-election effort back in 1972 as an opposition researcher and operative — sometimes described as a "dirty trickster," although he was not among those prosecuted in the Watergate era. He later set up a lobbying firm in Washington with Paul Manafort, who would be Trump's campaign chairman for several months in 2016. Cohn's ultra-aggressive lawyering eventually led to his disbarment in 1986 for unethical conduct. He died later that year of complications of AIDS (insisting in public that he was suffering from liver cancer). But 30 years later, experiencing frustrations as he moved into the White House, Trump was still missing his mouthpiece and mentor and reportedly asking his inner circle: "Where's my Roy Cohn?" Trump has since relied on a succession of personal lawyers — among them John Dowd, Ty Cobb, and now Rudy Giuliani — who are not likely to make him forget Roy Cohn. And any thought that his White House counsel, McGahn, was filling that role would now seem ill-conceived.